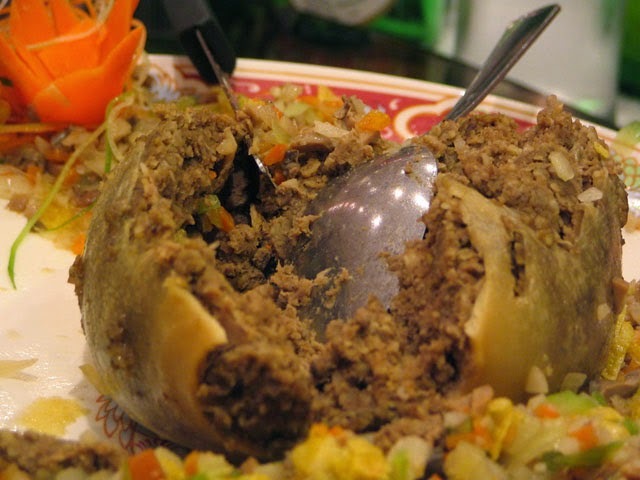 Shopan/joqeṣ̌ is a traditional dish from Gilgit-Baltistan particularly prepared on the occasion of Nasalo/Nos (Death celebration of cannibal king, Shari Badat). In Scotland, they call it Haggis and is their national dish. How to make the filling? · Take a bowl and put the minced meat. · Add salt, crushed red pepper and 3 chopped onion, mint, coriander and mix the ingredients. · Clean stomach or secum very carefully and properly and to avoid the smell marinate it with lemon or vinegar overnight. · Fill 1/3rd portion of stomach or secum with the mixture. · With the help of chopstick and thread sew the stomach/secum. · Take a deep pan and boil water add salt, keep heating until it starts boiling. · Put the shopan/joqeṣ̌ into the boiling water. · Cook it for three hours and add water if required. · When it is cooked, drain the water to a bowl and serve shopan/joqeṣ̌ in a dish. Cut the shopan and serve it with plain rice or with homemade wheat bread. Scots serve it with mashed potatoes. Once it is cooked, It is preserved for the family members who live far away home. The filling of this dish is of two types, If the filling is made with buckwheat mixture we will call it Joqeṣ̌ and the one filled with meat and spices will be named Shopan. Its name may vary in GB as we have more than seven languages in different regions. These names of this dish are in Ṣ̌īnā. The buckwheat mixture of Joqeṣ̌ requires similar ingredients and procedure we use to make Gittey . P.S. I don not own these pictures in the post.